Around sixty year old Chandrakala Devi, is originally from Ranti village and she learnt this art watching elder women and famous artists from there like mahasundari devi, godavri Dutt, she has all the regards for her mentor famous artist Shashikala Devi. 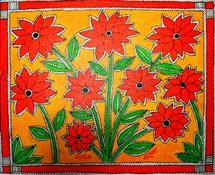 chandrakala started selling her paintings after Death of her husband twenty-five years back. Hailing from Mallah community(fisher men) fishing was her main occupation. Today chandrakala is the only breadwinner of a family of ten women which includes her four daughters, four grand daughters and grandson. 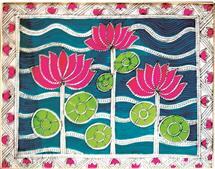 she makes very special paintings of nature,trees and animals and her works revolve around village life. 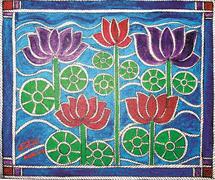 chandrakalajee is biggest example of women empowerment,will power and hard work.Her works has been Exhibited at Many Prestigious Art Galleries like Lalit Kala Academi, India Habitat Centre,New- Delhi, Gallery Time and Space ,Banglore,Indira Gandhi National Centre for Arts,New-Delhi,Nehru Art Centre,Mumbai and many exhibitions at Dilli Haat,Rajeev Gandhi Bhavan,Jaipur and Udaipur organized by D.C.Handicraft,Ministry of Textiles,Goverment of India.Madhubani art centre is very proud to be associated with her since last eleven years.